Visiting The Look Out is a great day out, with the main attraction being the hands-on science exhibition which has over 90 hands-on activities. We also have a gift shop and adventure play area. The centre is set in 1000 hectares of woodland which is owned and managed by The Crown Estate. 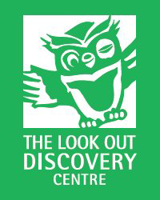 The Look Out Discovery Centre has over 90 activities suitable for children of all ages. Toddlers and younger children love the indoor stream, mini supermarket and particularly Built It! Older children through to adults will be fascinated by the hands-on science exhibits and puzzles. Entry prices are on our opening times and prices page. Grab a chance to win a family ticket to the hands-on science and nature exhibition, just complete any of our evaluation forms and we will enter you into the prize draw. It’s time to lift off! Launch a hydrogen rocket or send a huge hot air balloon skyward. See the world suspended mid-air by our Bernoulli blower. Challenge your body and brain. Test your reaction speed on Batak, or create an amazing design with our art machine. Can you solve the jigsaw of the human body? Have some colourful fun with Optimusic - step on the colour beams as fast as you can. Capture your silhouette in the shadow box or play a tune with laser beams. Play with boats in our indoor stream. Learn some incredible facts about our local wildlife. Become fascinated by the colony of busy leaf-cutter ants. Please note that the Woodland and Water Zone is outside but under cover. Become a member of The Look Out construction crew by helping to build the new house at The Look Out. Great teamwork is required. Use the rubble chute, wheelbarrows, design a house or drive the dumper trucks. Lots of fun. Please note that the Build It! Zone is outside but under cover. To avoid disappointment, please note that the activities and zones may change throughout the year. Please note there is no indoor picnic area at The Look Out. For information about disabled access to The Look Out Discovery Centre please visit the Disabled Go website. For The Look Out staff, organising birthday parties is a piece of cake! Book your child's birthday party with us now. A party at The Look Out is something different, exciting and fun. Parties are available all year around for children aged 5 to 12 years old. Each group is assigned a party explainer who will remain with you throughout the party, helping you get more out of your visit at the hands-on science and nature exhibition. Children's parties include a meeting with Eric our mascot owl, he's a hoot! Eric will deliver a special present to the birthday girl or boy. Minimum 10 and maximum 20 children. Get a 10 per cent discount card to use in the gift shop or use our ready-made party bags. The party also includes free invitations. We will send you the invitations by post, but they are also available to download from this page. We are happy to provide catering for your party. We also have a self-catering option if you would prefer to supply your own food. Don't forget to bring your own birthday cake. A selection of sandwiches including Cheddar cheese; tuna mayo; ham; egg mayo and strawberry jam Sausage rolls Tortilla crisps and dip Vegetable sticks such as cucumber, carrot, celery and peppers. Fresh fruit platter such as pineapple, grapes, melon, kiwi and oranges Blackcurrant and orange squash. Parents are asked to provide adult supervision at a ratio of one adult to every six children. A maximum of four adults may be admitted without charge. Extra adults need to pay the normal admission rates.